The United States missile defense (MD) base near the Romanian town of Deveselu, west of Bucharest, became operational this week, armed with 24 SM-3 Block IB interceptors, guided by a land-based version of the naval Aegis integrated combat system, using the SPY-1 radar. The US spent some $800 million to build and equip the base. Washington insists the MD base in Romania was built to counter a threat from Iran or other possible Middle Eastern rogue states and is not aimed at Russia. According to officials from the US and the North Atlantic Treaty Organization (NATO), the Romanian-based SM-3 missiles cannot intercept Russian intercontinental ballistic missiles (ICBM). Moreover, assurances have been made that nuclear-armed attack missiles will not be deployed in Romania. The SM-3 do not carry any explosives; they are designed to destroy high-velocity targets by hitting them directly. These assurances apparently failed to assuage Moscow, which declared the Romanian MD base a threat and promised retaliation (TASS, May 12). The fact that the MD base in Romania does not directly threaten the Russian strategic nuclear deterrent seems obvious. The commander of the Strategic Missile Force (RVSN), Colonel-General Sergei Karakayev, told journalists this week: “The European segment of the US MD may threaten the RVSN in a limited way but cannot critically affect its battle capabilities.” Karakayev boasted: “We are developing new ICBMs and new reentry vehicles able to negate existing or future global US MD capabilities. New warheads will be able to fly along unpredictable trajectories and attack targets from all directions” (Interfax, May 10). If so, why is Moscow seemingly obsessing about the Romanian base? The director of the Russian foreign ministry’s arms control and nonproliferation department, Mikhail Ulyanov, accused the US of inventing a nonexistent Iranian missile threat as a pretext to deploy MD capabilities that are, in fact, aimed at Russia. The Iranian nuclear problem was eliminated last year by an agreement signed in Vienna, but “the US did not follow up its promises to abandon MD plans in Europe,” according to Ulyanov. “This is a major mistake that can undermine strategic stability.” Ulyanov continued: “The MD base may be used to launch cruise and ballistic missiles, and this is a violation of the Intermediate-Range Nuclear Forces Treaty [INF]” (RIA Novosti, May 11). Russian officials accuse Washington of essentially building a double-use missile base in Romania—one that can be employed for both MD and for destroying vital strategic targets. In particular, Moscow worries the base will purportedly allow the US to eliminate President Vladimir Putin and other top Russian military/political leaders in a surprise first nuclear strike. The geographical closeness of the Romanian MD base to Putin’s official residence in Sochi, where the Russian president spends almost half his time and which has been turned into a de facto second capital, is seen as part of a sinister plan. Indeed, Putin is in Sochi this week, where he is holding a series of meetings with top Russian defense officials—and just across the Black Sea, the US is deploying swift and accurate interceptors that could hit his dacha in only a couple of minutes. Such a decapitating first strike would throw Russian defenses into disarray, allowing massed US and NATO forces to move in for the kill and lay waste to the Russian Federation. This nightmare scenario, apparently invented in the General Staff, has been dominating Russian strategic planning for more than a decade—since US plans to deploy MD interceptors in Europe were proposed. The chair of the Duma defense committee, Admiral Vladimir Komoyedov, and his counterpart in the Federation Council, Victor Ozerov, both insist the MD base in Romania and a similar base that will be constructed in Poland are aimed at Russia and have nothing to do with Iran. Ozerov quotes unnamed “specialists,” apparently from Russian military intelligence: “The US MD installations in Romania and Poland may be quickly rearmed to deliver nuclear weapons” (Interfax, May 12). If the MD base in Romania could target Putin’s Sochi residence, the one in Poland would presumably be able to hit Moscow—thus, the US would have a cocked gun pressed to Putin’s head at nearly all times. According to Alexander Grushko, Russia’s permanent representative to NATO, “the activation of the Romanian MD base must be taken in context of NATO deploying additional forces close to Russian borders: the deployment of SM-3 interceptors on Aegis ships in European waters and the development of the US Prompt Global Strike system [PGS], all of which threaten Russia.” Evidently, Moscow considers the PGS to be also targeting Putin directly. Grushko insists that MD deployments openly threaten the INF treaty (TASS, May 12). In the Russian government’s mind, this assumed grave threat requires a strong response. The possibility of deploying Iskander-M missiles in Kaliningrad enclave has been discussed, but that would be aimed against the MD base in Poland, which has yet to be built (Interfax, May 12). According to the defense ministry’s Star TV channel, Iskander missiles deployed in Crimea can wipe out the US MD base in Romania, but there is a problem: the Tarkhankut Peninsula—the westernmost part of Crimea closest to the base in Deveselu—is still some 700 kilometers away, while the official range of the Iskander-M ballistic missile is 500 km, as mandated by the INF. Star TV explains: The range of the Iskander may be easily extended “to several thousand kilometers” by using long-range Kalibr cruise missiles (Tvzvezda.ru, November 14, 2014). The defense ministry recently published footage of the launch of long-range land-based cruise missiles using the Iskander-M missile launcher (Tvzvezda.ru, April 23). 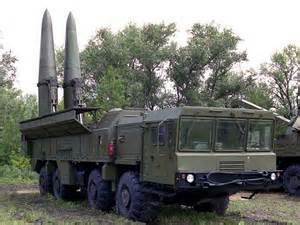 To establish a credible capability to target Romania with nuclear warheads using the Iskander, and perhaps to force Bucharest to rescind the US MD deployment in Deveselu, Moscow will have to entirely back out of the INF treaty to be able to officially test the Iskander at longer ranges, possibly using both ballistic and cruise missiles. The INF, signed by Ronald Regan and Mikhail Gorbachev in 1987, has been under a growing threat for some time, with both Washington and Moscow accusing each other of violations. In 2007, as Putin was dramatically turning Russia on a path of acute confrontation with the West, he repeatedly openly threatened to scrap the treaty, in direct connection with the presumed threat of US MD bases in Poland and Romania (see EDM, February 21, 2007). If the INF is scrapped, with it go the last vestiges of arms control, thus opening the door to a renewed arms race.